Professor Palmer is Emeritus Professor of Medieval German and taught regularly across the whole range Medieval German Literature, as well as the historical linguistics of German, Old High German, Middle High German language, and courses for graduate students on Palaeography and the History of the Book. His research interests are in Medieval German and Latin, language and literature. He is engaged in a collaborative research project, together with a group of colleagues in Germany. Switzerland and the United States, on the 'Literary topography of SW Germany in the 14th century', which is an attempt to establish a literary history of the region on the basis of the manuscript sources and library history. 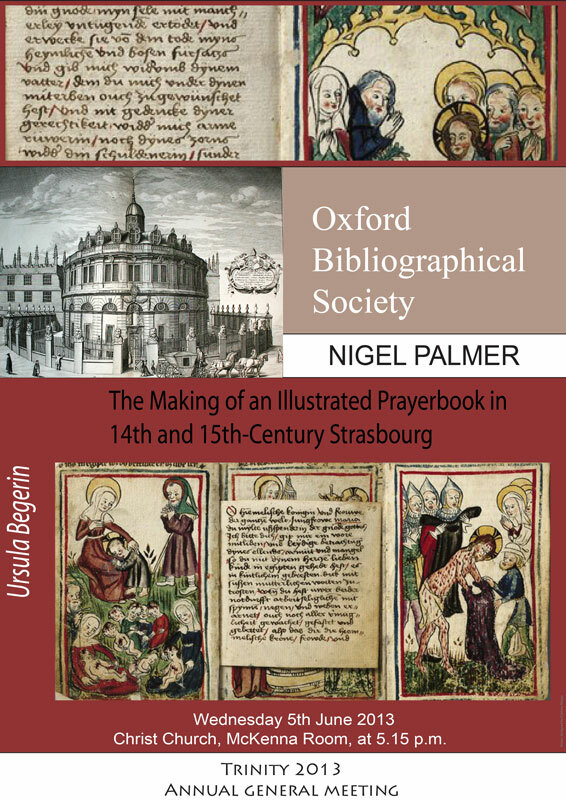 His main current project, however, is an edition, facsimile, translation and literary study of a late-medieval illustrated prayerbook from Strasbourg, the 'Begerin-Gebetbuch' (now held in Bern), together with the art-historian Professor Jeffrey F. Hamburger (Harvard). Other areas of special interest are blockbooks and their place in early printing history, the interface between Latin literature and German literature in the Middle Ages, the literature of the Cistercian order in Germany, and palaeography and codicology of the period 1100-1550. He is editor of Oxford German Studies (together with Jim Reed) and of Medium Aevum (together with Corinne Saunders and Sylvia Huot). He is a Fellow of the British Academy, a Corresponding Fellow of the Medieval Academy of America, a Corresponding Fellow of the Academy of Sciences in Göttingen, and received the research prize of the Alexander von Humboldt Foundation in 2007. The AGM will start at 4:30 pm; the Lecture will begin at 5:15 pm. Tea will be served before the talk. *Hard copies of the Statement of Accounts for 2012 and also the proposed revised text of the Constitution are available on application to the Secretary [cristina.neagu@chch.ox.ac.uk]. They, together with the AGM card containng the Agenda and Minutes are also available online. See attachments below.